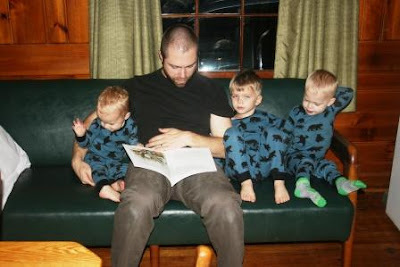 Two Bears Farm and the Three Cubs: What Kind of Books Do You Take When You're Roughing It? What Kind of Books Do You Take When You're Roughing It? We always take along several relevant books when we take trips. I have fun choosing books with themes related to our travels. For our trip to stay in the Pioneer Cabin and to ride the Cass Scenic Railroad, I had quite a few good choices. I also packed the book Freight Train for the twins, but somehow between packing it and arriving, it didn't actually make the trip. Funny how things like that happen. And reading with Mommy. We're lucky enough to have 3 little boys who love to read. 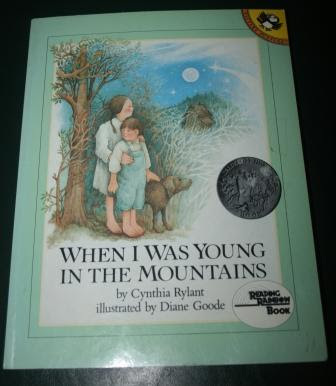 As it turned out, the most fitting of the books we brought was When I Was Young in the Mountains by Cynthia Rylant. It's long been one of our favorites, but it was fun to experience so much of the book in real life. Living life simpler, for a few days. No electricity. No running water. 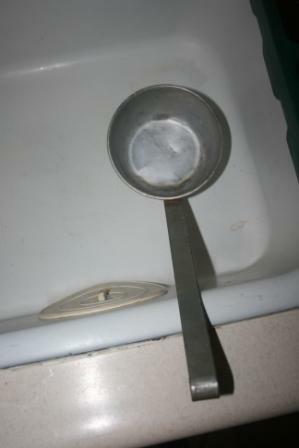 Brushing teeth with a dipper in the "sink". Which led to a conversation about how we could conserve more water at home - you don't need much at all to do little things like teeth brushing. Just like in the book, Pierce got to experience pumping icy cold water from the hand pump. We also experienced what is called in When I Was Young in the Mountains the 'johnnyhouse' or outhouse - or as they call it now, the vault toilet. Not so much fun in the middle of a cold night! Sadly, although we brought hot cocoa to drink like in the book, we couldn't get the wood cookstove to take correctly, so we opted for s'mores by the fire instead. Not a bad consolation prize, huh? If you're a breastfeeding mom, please check out my review and $40 gift certificate giveaway for Milk Nursingwear here! You're such a good Mommy! I love good childrens books, my kids had many when they were young. Good choices!...and what a great experience your boys will cherish. You really did pick out the perfect book. It looks like the boys had a great time during their time in the mountains. Love this! What great ideas- and photos! Curious George was one of the reasons my son learned to read.I had bought him a set and he would not rest until he could read them all himself! Thanks for the comment on my photo. Yes, I did find it a bit tricky, and I came up with the theme. But it all makes for good practice. What a great idea... taking book that relate to what you are doing. I never would of thought of that. When we used to go camping, it was in a tent and exploring was our main entertainment. Just can't emphasize how important reading is to a child and so necessary in their school years. Great post! memories they will have forever!! adorable pictures, i am soooo glad there is one with you also!! Fun! We enjoy taking Mr. McGee's Camping Spree, Owl Moon and others depending on our camping trip.As well, I try to bring along nature books relevant to our surroundings. 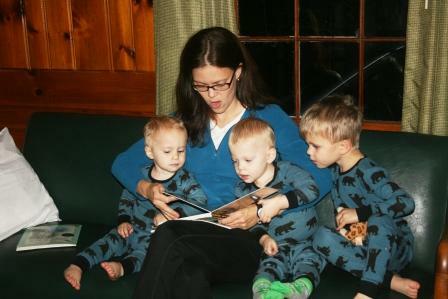 When I was Young in the Mountains is one of my favorite books to read to my boys, too! And Owl Moon. That one is super, too. Love it, I love that you took them on this adventure and brought books, too! :) You guys look so adorable, each of you w/your lil men! This looks like a really good book! I have never been roughing it in my life, even though we live in the mountains! Did the boys think it was great fun, or did it make them more thankful for their home when they got back? Thanks for visiting my blog. Yes, eBay is more difficult these days. Auctions don't get near the "excitement" they used to. 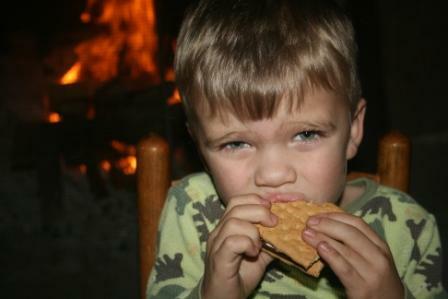 I would have been happy with the s'mores trade-off too. Using the water dipper would be such a fun thing to do! It's wonderful that you are teaching your boys the joy of reading. Your boys are just too sweet and adorable. My little boys are sporadic readers, especially my 3-year-old. Some days he loves it and wants book after book, but other days he can't sit still. And I love the matching jammies. I love mountains and cabins and adventures,. And I would love for you to read to me with your boys. One of our favorite books when Amy was little was Night Tree by Eve Bunting. The story is magical, and the illustrations are beautiful too! Great ideas! I don't think I would have thought to bring relevant books. We haven't roughed it as a family. 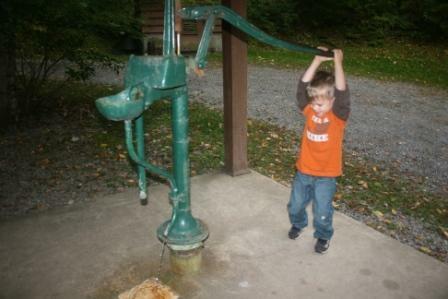 My roughing it days were all when I was a kid. I can't seem to talk my husband into taking us camping! Love the matching PJ's! I love the idea of taking our family somewhere to teach the kids about how things used to be, but I don't know if I could handle using an outhouse in the middle of the night! Just found your blog through JDaniels Mom and I love that you are a mom of boys too!! 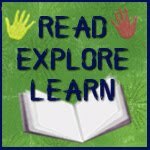 Your little ones are precious and I love the book ideas!! This is great. 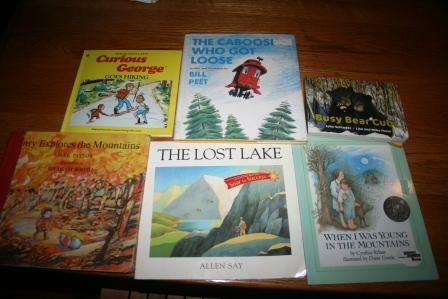 I still have all my children's books - hoping someday to read them to my grand children. it arrived yesterday at the farm but my dad brought it this morning to my home (we arrived late back home yesterday evening) And it was fantastic! But my mother and father in law LOVED the little doggie (as did i)! Oh those are such adorable pictures of you all with your sweet boys!! That trade off looks mighty fine!! So nice for you to get away from the fast pace of life for a while. Yall seem to have a blast!